I have a problem that I'm not ashamed to let the whole of the Internet know about. As a 36 year old man I am a great big wimp when it comes to horror games or anything that makes my mind play tricks on me. The mind is your worst enemy when it comes to playing these sort of games, as yes, while games like this make you jump every now and then when you play them, for me it's more the sights & sounds that happen while you play it that play more of a role in me becoming the 8 year old wimpy version of myself. 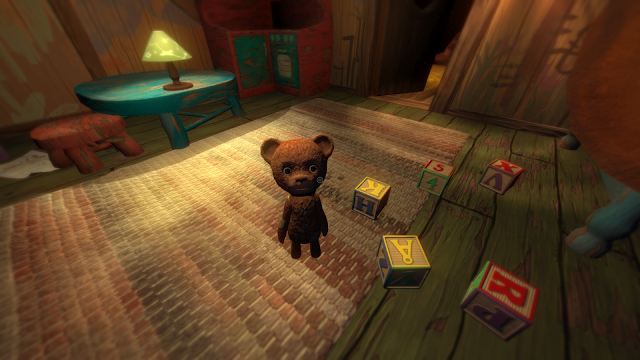 On the surface Among The Sleep looks to be cutest game a man/woman could ever wish for, with it all starting off at your second birthday with your Mum feeding you cake and everything being all fun. That is soon ruined however, when you're given a bloody adorable teddy bear after a knock at the door and Mum taking you upstairs for a little afternoon kip. Once Mum is out the room this cute little bear comes to life and talks and walks, and that boys and girls is where everything starts to go wrong. "Come in this closet and close the doors" asks Mr Bear. Erm, how about I bloody don't you weird yet adorable little bear. I have word blocks and a pink elephant just as cute as you I could sit and play with quite happily rather than locking myself in a dark place with you. Of course the kid knows no better and does it anyway. So it's no surprise that soon bear and Mum go missing, and it's your goal to go and find out what has happened to them both. How can you say no to this cute little thing? So with Mum out the picture what do you have to do to help get her back? I hear you ask. Simply put, walk around dark and scary places, while images and sounds scare the bloody pants off you if you're anything like me. If however you're a normal person who enjoys these sort of games, you walk around these levels working out small easy puzzles, which in turn unlock a a new memory that you and Mum share. You then take these memoryand stick then in this oven like contraption which unlocks the next chapter of the game.. 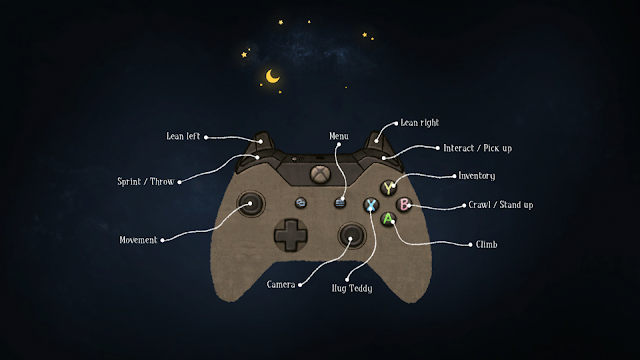 Among The Sleep much like the recently reviewed The Park is a very short story driven experience, with you as a small child learning a lot in the just under three hours of torture (by which I mean my fear of my own shadow) the game put me through to finish it off. It's not that Among The Sleep tries hard to be scary either, as in truth horror genre fans will find it somewhat of an easy ride when it comes to any jump moments. Much like other games in this genre that I've played recently, the game is more about your mind and imagination playing tricks on you, with the game having zero jump moments in all honesty. 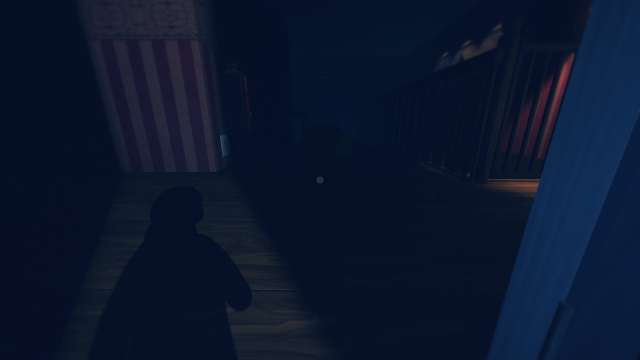 Almost all of the game your mind will picture up something way more scary than what you actually come across in the game. With Mum out the way the only real frights would be the Slender like moments where a witch like figure is hunting you down as you crawl around certain areas, but like I say, other than those it's all about the sounds you hear, which of course are way better while playing with a decent set of headphones on and playing the game in the dark. As for how it plays, other than those Slender like momentsAmong The Sleep doesn't really offer much else than being a decent two-year-old toddler simulator without the nappy changing and bottles. The game has a story, but it's more of a story to see and experience for yourself rather than me blab on about it. Without spoiling it though I will say it did leave me thinking "is that it?" by the time it was all done.As while it has a start and an end obviously, it felt like the end was just thrown at you without really going to deep into it all. To make the game play a little longer you of course have collectibles to hunt down and find, all of which have achievements locked to them too. Things like a music box and paintings are put into the game for you to hunt and track down, but nothing to hard if you want to get that full 1000g gamerscore that the game offers. Neither of these things add to the story however, so if you just want to crack on and finish the game you can of course forget these even exist. 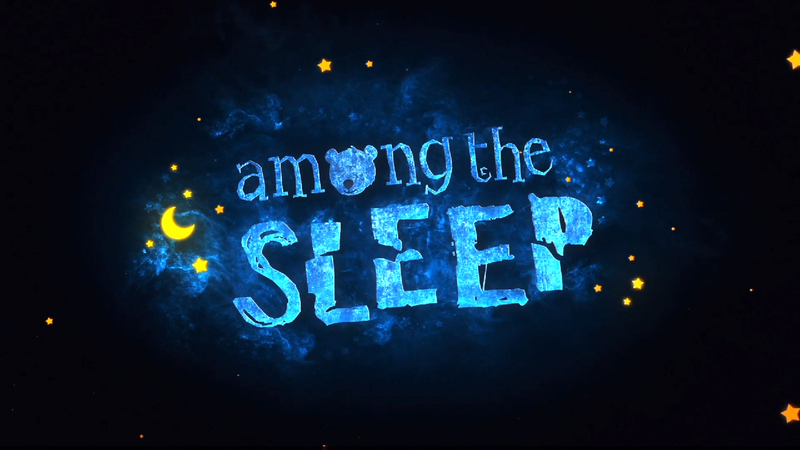 Overall: Among The Sleep while not being in my favourite genre of game, was still enjoyable enough that by the end of it that I didn't suffer for nothing. Like I said above, for the hardened scare fan this will not make you jump in the slightest. Playing as a toddler is certainly a unique twist on what is becoming the most overused genre in Indie games consoles though but I guess that's all thanks to the popularity of other games in the genre being watched by millions on YouTube.